Johnnie Walker Race Day 4 (video)--Antigua Sailing Week update May 3, 2018--The Johnnie Walker Race Day Prize Giving was held in Nelson's Dockyard following racing and Amy & Layla, collectively known as the Marshians played into the evening on the main stage, with the Copper and Lumber Store historic Inn providing fine dining in the form of Seafood Thursday. Across the 13 classes competing, leaders are emerging, and with the likelihood of just one race tomorrow, several classes are all but decided. Peter Harrison's British superyacht Sojana and Jonty and Vicky Layfield's Antiguan Swan 48 Sleeper X, remain unbeaten. AntiguaSW video above published Apr 30, 2018: Blasting into Fever-Tree Race Day! AntiguaSWVideo published Apr 29, 2018: Mother Nature delivered fantastic conditions for the first day of the 51st edition of Antigua Sailing Week. English Harbour Rum Race Day was spicy, packing a real punch. With 20 knots of breeze and a building sea state, the 116 teams that took to the combat zone revelled in fast conditions drenched in sparkling sunshine. See the Peters & May Round Antigua Race 2018 and other Antigua Sailing Week 2018 videos here. See also Virtual Eye -- Volvo Ocean Race Leg 8 started 22 April 2018 from Itajai, Brazil, at 17:00 UTC (14:00 Itajaí) 1:00 p.m. EDT (US). MAPFRE take a stunning win into Newport - Volvo Ocean Race 2017-18: "The Spanish team MAPFRE made an incredible comeback over the final 24 hours to steal a leg win on Leg 8..." read more at link above. 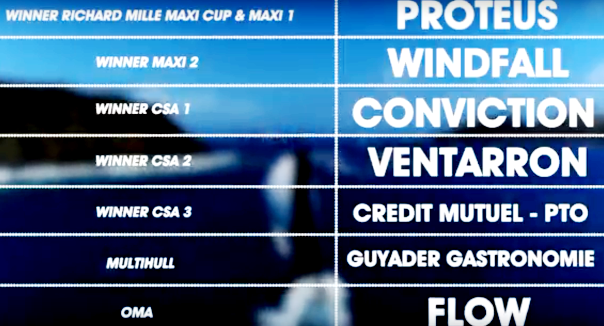 Volvo Ocean Race video above published May 8, 2018. See also previous Volvo Ocean Race 'Daily Live' Shows (videos). The World Sailing Show video above published May 3, 2018: As the fleet heads north to Newport the pack is re-shuffled once again. Team Brunel has once again turned on the gas, and the battle for the long game has never been closer. The Itajaí In-Port Race ...in 137 seconds (video) and Skippers' Leg 8 Start Press Conference (video). Notes: Vestas 11th Hour Racing dismasted and motored to the Falkland Islands. Sun Hung Kai/Scallywag diverted to Chile following the loss of John Fisher, the Volvo Ocean Race SHK Scallywag sailor who was reported overboard on Monday, March 26, 2018, and is presumed "lost at sea" (video). More info: JohnTheCrowd | Sailing News: Volvo Ocean Race Leg 7, Auckland to Itajai, March 18 Start, LIVE Feed and VolvoOceanRace.com. Volvo Ocean Race video published Apr 18, 2018: Extended cut, 360 footage of Brunel Sailing in the Southern Ocean! You've never seen Pistol Peter Burling helming like this before! This video was captured by Yann Riou on the Garmin VIRB 360. Vestas 11th Hour Racing video published Mar 30, 2018: For some, it was their first, for others their fourth or fifth rounding but for all the sailors, it was the end to grueling journey through the Southern Ocean, and a chance to pay their respects. Watch the rounding of Cape Horn from on board Vestas 11th Hour Racing on 29th March 2018. Vestas 11th Hour Racing Rounded in 2nd place at 1501 UTC. Volvo Ocean Race video above published Apr 16, 2018: Vestas 11th Hour Racing has arrived into Itajaí – here's a look behind the scenes as the blue boat docked in under jury rig following a Leg 7 dismasting. Vestas 11th Hour Racing video above published Apr 16, 2018: At 1000 local time on April 16, Vestas 11th Hour Racing sailed into the Rio Itajaí-açu with three modified sails and a jury rig fabricated in the Falkland Islands. Covering 1600 miles in nine days, the delivery crew of five were all smiles as the shore team, fellow competitors and Volvo Ocean Race staff greeted the boat in the Race Village in Itajaí, Brazil. Now just days to go until Leg 8 Start on April 22, 2018. A look back at the 2017 Rolex Sydney Hobart Yacht Race--CYCATV video above published Dec 29, 2017--A collection of short clips of the race on Wax Lyrical, from leaving the dock at the CYCA to Tasman Island. Les Voiles de St. Barth video published Apr 9, 2018: François Tolede, Organizer of Les Voiles de St. Barth; Alessandra Sublet, Marraine 2018; Jimmy Buffett, 2018 Godfather. See also special video message from Jimmy Buffett for all the sailors in the world re: Les Voiles de St. Barth, published Feb 15, 2018. Official website: www.lesvoilesdesaintbarth.com and regatta results. Volvo Ocean Race video published on Apr 6, 2018: Ever wondered how the Volvo Ocean Race captures & sends back footage from some of the planet's most remote places? Volvo Ocean Race video published Apr 6, 2018: After the gruelling Southern Ocean and Leg 7, Itajai, Brazil welcomes the Volvo Ocean Race.